You know your wife or partner really is your ‘better half’, so you want a gift that she will love, though that can create a dilemma as you look at all the Christmas gifts on offer. Knowing how difficult it can be, we’ve put together a list of incredible gifts just for her. We have chosen Xmas gifts that are meaningful and unique. These are gifts that combine romance with glamour. Traditional gifts with a contemporary twist. All to ensure that you and your partner have a wonderful festive season. Treat your wife to a classic gift this Christmas. A sweater, a new bag, toiletries may all be classic gifts, but instead of a Christmas sweater with a bold winter pattern, consider cashmere for the smooth feel of luxury. If she needs a new bag, a ‘Mini’ bucket bag crafted from Italian leather, kept in its original hue or dyed to her favourite colour will be a sophisticated surprise. A spa gift is something can put together yourself, or for a spa stay away from home buy a gift certificate that lets her choose the date. Otherwise create a spa gift basket set with the best quality massage tool, slippers and a selection of her favourite face-masks, body scrubs and bath bombs. Placed in a decorated tin or a beautiful basket this is one gift that is surely going to win her heart. Promise she will not be interrupted in her time of relaxation and rejuvenation. Whisk your wife away to a night of luxury. If you have children or pets, arrange for family or friends to take care of them for the night whilst you both head to a local hotel. Make this trip even more special with a bottle of Rosé champagne from one of the world’s recognised brands to be sure your champagne will be of the quality your wife deserves. If your beloved enjoys surprises, secretly prepare an overnight bag for her and ask her to meet you at a particular time and place from where you can whisk her away. Ask her friends for help in making the arrangements if you’re not sure what to pack. Another romantic gift takes a bit more time, but is well worth the effort. Take a pack of playing cards and find 52 things to say about your spouse that you like. Write these on labels and stick the labels on the back of the cards. This is one a unique gift she will treasure for many years to come. If you want to buy your wife a piece of jewellery, before you head to the store, consider the style of jewellery she already wears. Is this jewellery that works well both at work and on nights out? Does she have a preference for a particular designer? You can answer these questions by looking in her jewellery box when she’s out. If you’re not entirely sure, you can’t go wrong with the original designs from established artists. Art Nouveau period jewellery pieces encapsulate the vintage trend with curved lines and ornate, natural motifs, making each piece of jewellery both enchanting and eye-catching. You can show your partner how much you love, respect and admire them through the symbolism of jewellery. 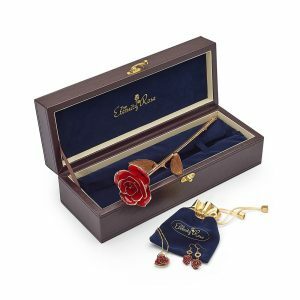 An earring and pendant set that combines 24 karat gold, red roses and diamonds has love running through it. The set includes a pair of miniature natural rose petal earrings and matching heart-shaped pendant. The rose petals have been intricately glazed and trimmed with 24 karat gold and studded with multiple synthetic diamonds. Flower may be a traditional gift for a wife, but this does not always have to be a bouquet or centre-piece. A printed dress that shows off her assets is not just fabulous, it’s a non-stop compliment generator, too. Less girly and more womanly and relaxed, you can choose a hot-pink floral dress with a contrasting striped bustier that will get plenty of attention, even though it’s a simple throw-on-and-go dress. There’s nothing more romantic than cooking a meal for someone, and to do so on Christmas day is an incredible gift. Cook some of the food together, accompanied by a glass of wine so that you can have fun and relax before dinner. Your menu could start with oysters or a chicken liver pate. Main course could be a Thai beef or prawn salad or Vietnamese pork balls and for dessert chocolate raspberry cupcakes or rosewater and lychee Sorbet. Choose a menu that lets you do much of the preparation before Christmas day itself. This reduces any time pressures and leaves you with the energy to do all the clearing up on the day, without creating any stress.